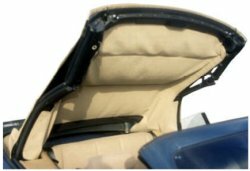 Stock Interiors is proud to offer the highest quality Chrysler LeBaron Convertible Headliners. This convertible headliner is the material that installs inside the car and covers the convertible top frame. This headliner will replace the original Chrysler LeBaron convertible headliner and will install just like the original did.